A critical component of any political ruling system is the way in which it has come to power and how it has gained legitimacy. In Islam the three ways defined for coming to power are either through force, succession or Shurah (council). However – in the west and other countries which toe the line of democracy – the only way to gain approval stamp or legitimacy certificate is through the electoral system. The west headed by America entered Afghanistan under the slogan ‘rule of the people’ and stated that every government from today shall only come to power through the ballot box. However, in practice, it inaugurated a mechanism where the only way a person could rule over Kabul was with the blessing of America. America initially launched concentrated propaganda depicting the Loya Jirga or Grand Assembly as the only true source that could appoint a head of state, approve the constitution and give rulings on other major matters and in this series many supposed Grand Assemblies were convened. Karzai’s transitional period, constitution, security agreement with the US, peace council and other critical affairs of the fiercely independent Afghan nation were legitimized by these so-called Grand Assemblies – the members of whom were fattened by American dollars while residing in Germany and other western capitals. Although the Afghan nation considered such manipulation of the name of Loya Jirga as adding insult to injury but a nation whose hands were tied with titanium chains could do nothing but endure patiently. As this game was being played with the name of Loya Jirga, the electoral drama between Ashraf Ghani and Abdullah began encapsulating the nation. The open fraud, rigging and overall chaos in the previous year’s elections failed to bestow even a semblance of legitimacy to the upcoming government. As the prescription drug of elections failed twice, the people began awaiting the convening of another supposed Grand Assembly – but to their surprise and the surprise of many others – America instead opted to deploy a Grand Wizardd. The Grand Wizard John Kerry arrived to Kabul and with a swipe of his wand both arch rivals Abdullah and Ghani were spell bound and like remote controlled toys they began embracing each other and the result was an illegitimate offspring named the ‘National Unity Government’. Up until yesterday everybody was told that the National Unity Government’s period was for two years which was set to expire after four months. This was not only being repeated frequently by members and media affiliated with Shura-e-Nazar (Supervisory Council created by Ahmad Shah Massoud) but meetings had also begun taking place among Team Abdullah and the opposition in preparation for the upcoming Loya Jirga or possible early elections. The guest house of Sayyaf in Paghman witnessed many gatherings by Hamid Karzai and the opposition over the past few days. Winds of change were also being pushed by Tolo, Metra and Khurshid TVs affiliated with Shura-e-Nazar and Amrullah Saleh even went as far as to say that the term of NUG (National Unity Government) ends on 21/09/16 and any extension has to have the consent of the people. These poor people who shouted ‘Government Government’ from the top of their lungs were unaware that the string of this kite – the supposed Government – is actually in the hands of a Grand Wizard residing on the other side of the globe. As the believers in governmental system were sound asleep dreaming about the upcoming Grand Assembly, the Grand Wizard swooped in unexpectedly on Khwaja Rawash Airport, went straight to Arg (Presidential Palace), met with A and B and immediately convened a conference which quashed any dreams of upcoming Loya Jirga or early elections. John Kerry extended the expiration date of the regime by three more years during his short conference and declared that the government shall complete its 5 year period under the leadership of Ashraf Ghani. John Kerry declared “Let me make this very, very clear because I brokered the agreement: there is no end to this agreement at the end of two years, or in six months from now. This is an agreement for a unity government, the duration of which is five years”. 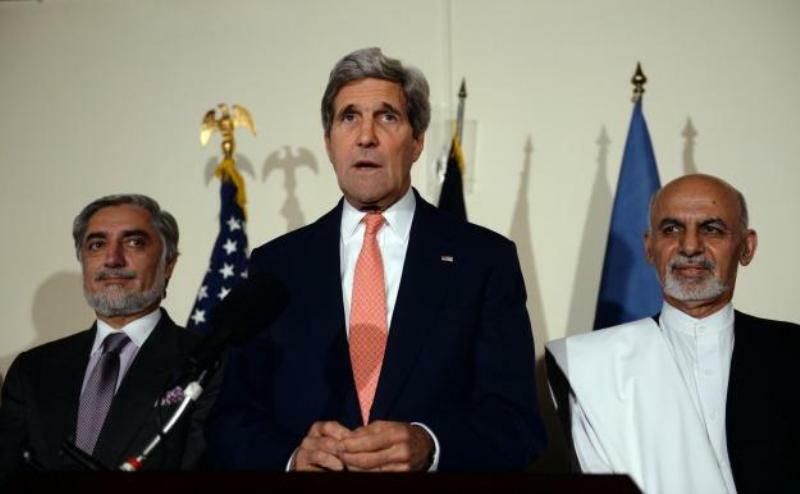 This announcement by John Kerry froze all debates over the government and silenced all opponents. So Bravo to John Kerry who played the role of the Grand Assembly all by himself, making it very clear to everyone the limits of control exerted over our country by the invaders. A country whose most critical decisions, even the setting up of a government are in reality dictated by the US Secretary of State.